30 Newark juniors & senior (preferred) high school students will work on a visual arts project at the Paul Robeson Art Galleries at Express Newark taught by leading art educators, located at 54 Halsey Street, 2nd Floor. This program is funded by the ArtStart grant, provided by Newark Arts Council. 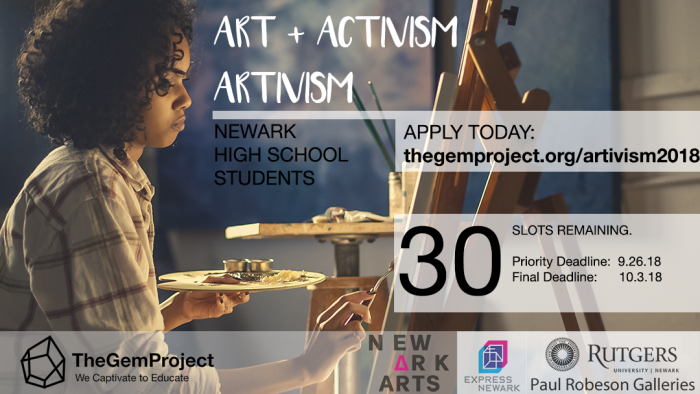 Engage with activist artists and work on visual art projects that address a social issue by leading art educators from Newark, NJ. Learn how policies impact the chosen social issue, while using art to inform and educate the community at-large. Organize as a cohort their own call to action through the arts and discuss their own recommendations for social change. Receive preference to summer employment for July-August 2019, through a paid community organizer internship for 6-8 weeks by The Gem Project, Inc. Earn 60-70 hours of meaningful community service hours over 11 weeks between October-December 2018. If a current high school senior, be considered for The Gem Project Fellow Award 2019 ($1,000.00) value and receive notification when the pool opens for all applicants. Can earn prizes by community partners during sessions.